I'm honored once again to have one of my bikes picked for an award at the Handbuilt Bike Show. 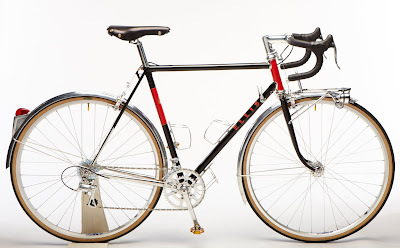 Travis' randonneur took the honors as "Best Road Bike", and I couldn't be happier! The show was also a huge success from a business standpoint with quite a few orders taken and lots of interest from others. I look forward to working with everyone who's either on the list now, or thinking about sending in a deposit. Now to get a good night's sleep and prepare for the 20+ hour drive home, I hope the weather cooperates, I can't wait to get home and see Lisa and the cats! Well, Travis made the drive over from MN on Saturday, and we managed to get all the lights and wiring dialed in. Then I finished running all the cables and got the bars taped today. It's ready for the show! I'll just give you a tour of a couple of the highlights! 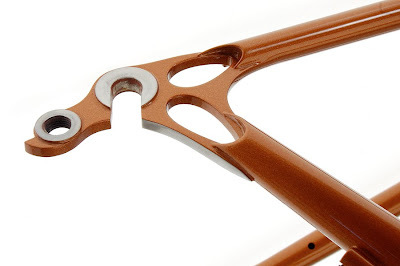 To see it up close, stop by my booth at NAHBS this weekend! I used the Schmidt SONdelux front hub, it has the contact built into the front drive side dropout, so no plugs to worry about, just install the wheel correctly and your generator is ready to go. 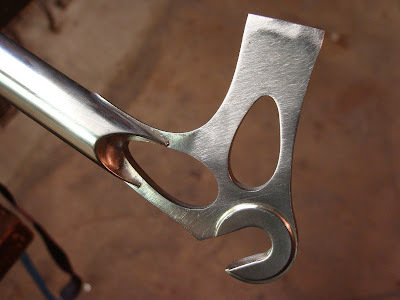 The dropouts are stainless plate, so I finished them with slightly raised points and Jason masked the whole dropout. The custom front rack with internal wire routing and Edelux front light, super bright! We made all the wiring connections and then slid them up inside the steerer tube. All that's visible is a small wire heading into the frame for the taillight. That's all for now, I'll see you in Austin! OK, so I've tried to explain my dropout design from a strength and durability standpoint, but now I'd like to focus on the aesthetics and functionality of them as well. 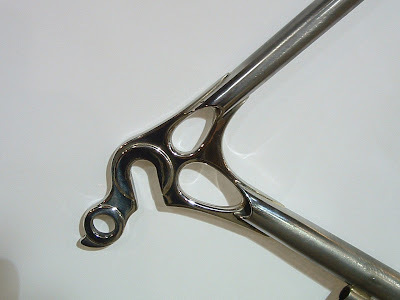 My first go at the design was a completely hand cut set of dropouts for my 2006 NAHBS Waterford. I picked up some stainless plate and had at it with a combination of drill bits, a die grinder and dynafile. Very cool looking in the end, but WAY too much work. I knew when I started Ellis that I'd need to get these into a CAD program and find someone to cut them for me. 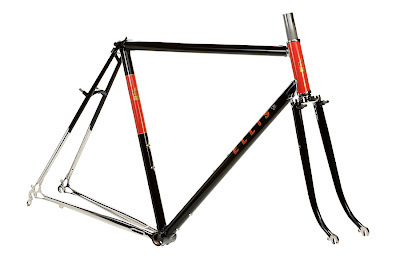 My original design, featured on my 2006 Waterford for NAHBS. Well, about the time I was getting Ellis Cycles off the ground, my friend Scott offered to do the CAD work to get the process started. Honestly, I hadn't really expected to take on my own dropout design for at least a year or so, but Scott was super helpful and connected me with a shop that would cut very limited quantities, so I wouldn't have to order 100 pairs at a time! When it came to the design, I had some criteria in mind. 1. 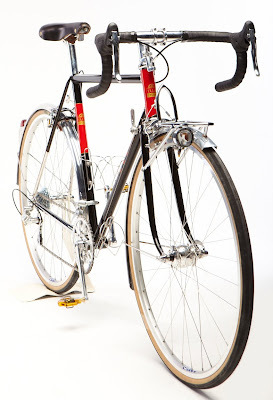 It had to work with large diameter 953 chain stays. 2. 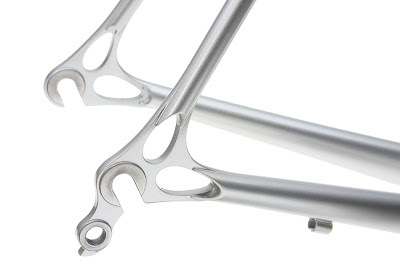 I choose stainless steel since I planned to offer fully polished stainless rear triangles. 3. 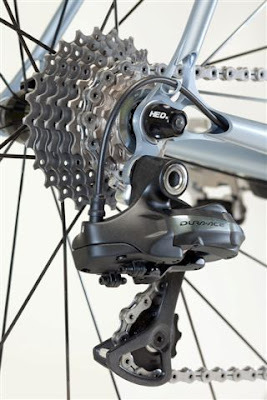 It needed to work with a wide range of chain stay/ seat stay angles, from the smallest to largest frames. One of the cool features my dropouts allow me to feature is internal cable routing, whether it be Di2 wiring, (above) or a derailleur cable. Ellis dropout brazed to a 953 chain stay. Some folks might know this, but for those who don't, the minor end of a chain stay can vary in diameter from around 12mm to as much as 17mm. 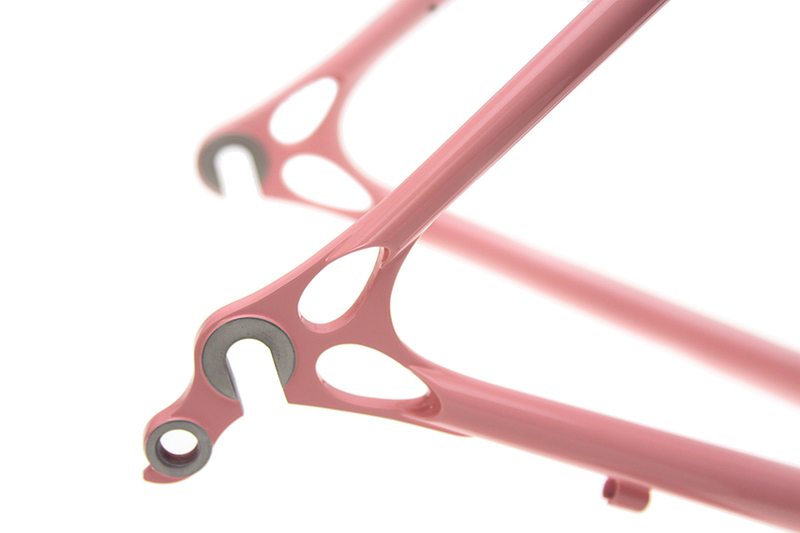 Above is a good example of the larger stay, which mates well with the wide tab on my Ellis dropouts. On smaller stays, I'll often cut the minor end of the stay back to give me some extra width for attaching the dropout. 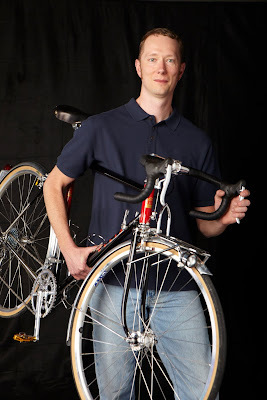 Another of my pet peeves is dropouts on really small or large bikes that end up looking dog-legged. 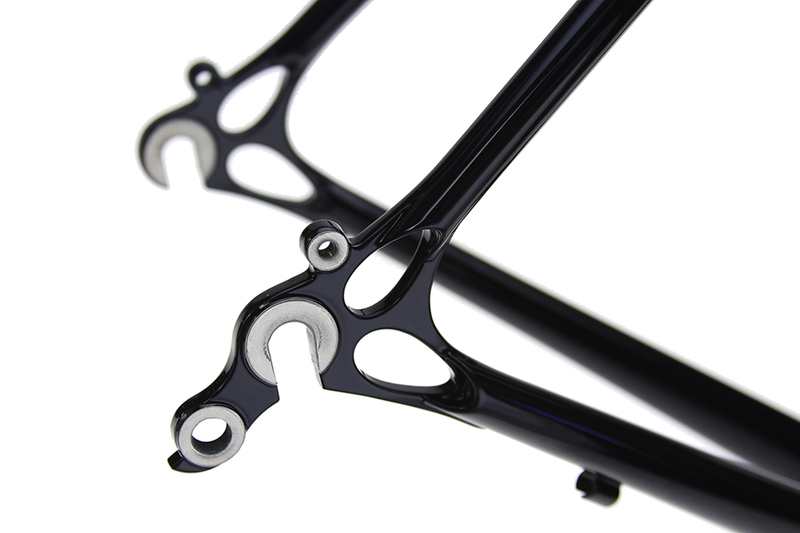 In other words, the tab of the dropout extends in some angle, say 70 degrees, and then the stays get attached at an angle like 60 degrees for a small frame. I'm sure that it's plenty strong, but it's just plain ugly. 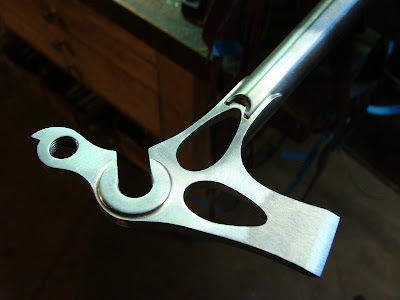 What the seat stay tabs on my dropouts allow me to do is to shape the dropout to match this angle. Below you can see examples of both a really small frame (Sydney's), which has a angle of 65 degrees, and Steve's frame, which is pretty large with an angle of 77 degrees. On both of these, I carefully scallop the stay and locate it on the dropout to make it as seamless a connection as possible. This last feature is one that just happened kinda organically on one of the first bikes I built with the Ellis dropouts. I had a fairly large chunk of tab that I needed to finish down on the bottom of the chain stay when I realized, if I leave this a bit proud of the stay and then have Jason mask off the paint, it makes a nice landing spot for the rear axle with no chance of chipping the paint off the dropout or chain stay. Once again, the fact that these dropouts are stainless came in handy as well! All the Ellis dropouts get this "sliver" polished and masked off to protect the rest of the paint. That's all for now, my next post will discuss the lugs I prefer and why.